Petraeus Pouts About His Small Drone Fleet, But Did He Hide Benghazi Intelligence? 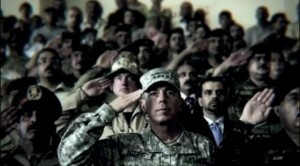 Is Petraeus still an untouchable Washington darling? CIA Chief David Petraeus wants to expand his drone fleet by about one third, according to the Washington Post. We learn from the Post that the CIA now has a fleet of about 30 to 35 drones capable of use in attacks and Petraeus would like to increase that number by about ten. Paramilitary activity seems to be quite a stretch for an agency whose name describes its role as intelligence rather than fighting. It would appear that this time, as usual, Petreaus has found the proper location for applying more of his charms and has aligned the political forces to favor his objectives. https://www.emptywheel.net/wp-content/uploads/2016/07/Logo-Web.png 0 0 Jim White https://www.emptywheel.net/wp-content/uploads/2016/07/Logo-Web.png Jim White2012-10-19 10:56:532012-10-19 10:56:53Petraeus Pouts About His Small Drone Fleet, But Did He Hide Benghazi Intelligence? Journalists and human rights groups found a collection of damning–but not the most damning–records of Libya’s cooperation with the CIA and MI6, all wrapped up in binders with labels marking CIA and UK collaboration. Documents found at the abandoned office of Libya’s former spymaster appear to provide new details of the close relations the Central Intelligence Agency shared with the Libyan intelligence service – most notably suggesting that the Americans sent terrorism suspects at least eight times for questioning in Libya despite that country’s reputation for torture. And yet few people seem to have thought how curious it is that such a collection came to become accessible all wrapped up with a pretty bow. As I said, it appears these binders don’t include what would be the most damning record of CIA collaboration–which would be a record of how it was that Ibn Sheik al-Libi came to be suicided in April or May 2009, just as records of the US torture program were released. Nor does it include what would be the most damning record of MI6 collaboration, negotiations trading release of the Lockerbie bomber, Abdelbaset al-Megrahi, in August 2009 for BP drilling rights in Libya. The records reportedly stop short in 2007 (in spite of a similar “discovery” just last week of a letter al-Megrahi wrote from Scottish prison in late 2007 or early 2008, declaring his innocence), before any of those events. Note, too, the way the NYT ties these files to Moussa Koussa, the Michigan State-educated former Libyan spook in chief. Perhaps the timing and the English language of these makes that tie clear, but it seems … convenient, in ways I’ll return to. Boy has Charlie Savage caused a headache for Barack Obama and Harold Koh. The Senate Foreign Relations Committee had a hearing to grill Koh today, in part, because of Savage’s report that Obama overrode OLC, DOJ, and DOD lawyers in deciding that we are not engaged in “hostilities” with Libya and therefore he can blow off the requirements of the War Powers Resolution. Granted, the Obama Administration limited the headache by having just Koh, who sided with Obama in the dispute, and not those lawyers who were overridden, appear at the hearing. Committee Chair John Kerry admitted they had been invited, but declined to attend. The issue of how Obama came to claim Libya did not involve “hostilities,” by itself, had Koh speaking in circles worthy of his former student, John Yoo. Richard Lugar–who by partnering with Senator Obama on a key foreign relations law gave him some credibility in the area–started the hearing by citing both Savage’s article citing the wisdom of candidate Obama and the one depicting President Obama overriding key lawyers on this issue. It was about that point of the hearing where Charlie Savage revealed, via Twitter, that 15 years ago he served as an intern in Lugar’s office. When Jim Risch raised the same quote from candidate Obama (Savage said nothing about interning for Risch), the lawyer now sanctioning Obama’s curious definition of hostilities said that candidate Obama’s 2007 stance on presidential war powers was legally incorrect. So we’ve learned today that 2007 Harold Koh didn’t agree with what 2007 Charlie Savage reported 2007 Barack Obama believed about the law. But in 2011, Savage’s report made clear, 2011 Koh is the key administration lawyer who agrees with 2011 Obama’s views on the law. I’m watching the Senate Foreign Relation Committee’s grilling of Harold Koh–either bmaz or I will post on that later. But Jim Webb just made a really important point. He noted that we have suspended, but not severed, our relations with Libya. After cornering Koh on that issue (and finally getting Koh to acknowledge that point), Webb then asked “What is the constitutional limitation on the assassination of a head of state?” Koh replied that the ban on assassinations is an Executive Order, not a law (a point I make all the time, given that it means the ban can be pixie dusted at will by Presidents). Webb then said that Nobody up here wants Qaddafi to remain. But moral standard we set is one we should expect. In other words, Webb notes, if we actively work to assassinate the leader of a country we recognize, we are implicitly endorsing such actions against us. Silly Webb doesn’t get yet that the US operates under one giant double standard, I guess. By my count, the OLC memo retroactively authorizing the bombing of Libya mentions the importance of UN or UN Security Council credibility nine times, including these two extended discussions. Never mind that the Administration felt no need to bomb Cote d’Ivoire to maintain the credibility of the resolutions regarding that country, the Obama Administration just bombed another country in the name of “credibility” of the UN. While the Administration’s stated concerns about credibility focus on the UNSC, it extends (according to this memo) to the UN’s effectiveness generally, the UN’s security, and its relief efforts. The UN Special Rapporteur on Torture, as part of the methods of work for his mandate, requires unimpeded access to all places of detention, where he can hold private, confidential and unsupervised interviews with detainees. The requirement of a private, confidential and unsupervised interview is a standard practice of the Rapporteur’s mandate and ensures the credibility of any interviews that an independent expert holds with detainees or persons who allege that they have been subjected to torture and ill-treatment. “I have since last year on several occasions raised serious concern about the conditions of detention of Mr. Manning, who since his arrest in May 2010, has been confined to his cell for twenty-three hours a day at the Marine Corps Brig, Quantico, Virginia. I have also urged the authorities to ensure his physical and mental integrity,” said Mr. Méndez. On Friday, April 8, the Special Rapporteur held a conversation with high authorities in the Departments of Defense and State. Those officials confirmed that Manning could ask to see the Special Rapporteur if he so wished and in that case the US Government would have no objection to a ‘private visit,’ meaning a visit that is monitored by prison officials. But the Obama Administration has given Special Rapporteur Juan Mendez the same kind of run-around they gave Dennis Kucinich, and then ultimately refused to comply with the standard practice. Apparently, our “national interest” in the credibility of the UN extends only so far as it allows us to bomb other countries, but not so far as it might expose our own treatment of detainees to independent evaluation. Update: Title changed to get the type of visit correct. Mark Hosenball, who yesterday broke the news that Obama had issued a Finding authorizing the CIA to operate covertly in Libya in the last 2-3 weeks, today says “intelligence operatives” were on the ground before Obama signed that Finding. U.S. intelligence operatives were on the ground in Libya before President Barack Obama signed a secret order authorizing covert support for anti-Gaddafi rebels, U.S. government sources told Reuters.The CIA personnel were sent in to contact opponents of Libyan leader Muammar Gaddafi and assess their capabilities, two U.S. officials said. The president — who said in a speech on Monday “that we would not put ground troops into Libya” — has legal authority to send U.S. intelligence personnel without having to sign a covert action order, current and former U.S. officials said. Within the last two or three weeks, Obama did sign a secret “finding” authorizing the CIA to pursue a broad range of covert activities in support of the rebels. Congressional intelligence committees would have been informed of the order, which the officials said came after some CIA personnel were already inside Libya. Now, one explanation for this is simply that Obama sent JSOC–under the guise of preparing the battlefield–rather than CIA. It sounds like the practice–first exploited by Cheney–that the government has used frequently in the last decade of ever-expanding Presidential authority. Indeed, House Intelligence Chair Mike Rogers’ claims he must authorize covert action, but hasn’t, sounds like the kind of complaint we’ve frequently gotten when the President bypassed the intelligence committees by claiming DOD was simply preparing the battlefield. And Hosenball’s nuanced language about “boots,” that is, military, on the ground, may support that view. Furthermore, we know there are a slew of British Special Forces on the ground in Libya. So why not Americans, too? Hosenball is not saying this explicitly, yet. And he does refer to “CIA operatives” (who could be in Libya to simply collect information). But all the subtext of this article suggests that our special forces have been on the ground since before any Finding, which in turn suggests they may have been there longer than 2-3 weeks (the timeframe given for the Finding). This is all a wildarsed overreading of Hosenball at this point. But if I’m right, then it would mean Obama would be using the shell game he adopted from Cheney to engage in war without Congressional oversight. After all, according to Holder v. Humanitarian Law Project any help to a terrorist group–even counseling on how to make peace–is material support. And no matter how we try to spin arming rebels as an act of peace, it’s a good deal more help than legal counsel. And, as the DC Circuit’s decision yesterday in Uthman Abdul Rahim Mohammed Uthman’s habeas suit makes clear, it’s not enough for a person to stop associating with al Qaeda in the 1990s, nor does the government need any real evidence of a tie between someone in al Qaeda’s vicinity to claim that person is a member of al Qaeda. Uthman filed a challenge, and in February 2010, District Court Judge Henry H. Kennedy, Jr. ruled that he was being improperly held and that the United States had failed to demonstrate that he was a member of al-Qaeda. As ProPublica detailed, the government censored Kennedy’s decision and quickly appealed the case to a court that was already lowering the government’s burden for proving a prisoner’s detainability. In another case last year, known as Salahi, the appeals court rejected a lower court’s standard that the government show direct evidence the detainee was a member of al-Qaeda. In that case, the court sent the detainee back to the district court to have his habeas corpus petition reheard. In today’s opinion, written by Judge Brett Kavanaugh, the appeals court went further by reversing the habeas win outright. In doing so, the court determined that circumstantial evidence, such as a detainee being in the same location as other al-Qaeda members, is enough to meet the standard to hold a prisoner without charge. By the DC Circuit’s standards, it seems clear, at least some of the rebels we’ve been helping (and are debating arming) are the same as al Qaeda for legal purposes. Which would mean we’ve already been offering material support to terrorists. If I were Obama, I’d make the decision quickly about where he wants to be tried for material support of terrorism. If Bud McKeon has his way, he’ll take away the President’s decision-making authority on whether to try Americans in civilian or military trials. So if you’re the President and need to decide where to try yourself for material support for terror, where do you do it? Update: Mark Hosenball cites four different sources saying Obama signed a covert order to arm the rebels 2-3 weeks ago. I forget. Does material support for terrorists done under cover of a Finding qualify as material support for terror? https://www.emptywheel.net/wp-content/uploads/2016/07/Logo-Web.png 0 0 emptywheel https://www.emptywheel.net/wp-content/uploads/2016/07/Logo-Web.png emptywheel2011-03-30 11:13:212011-03-30 11:13:21Where Will Obama Try Himself for Material Support for Terrorism? Bittman doesn’t say it, of course, but just since Monday we’ve probably dropped enough bombs on Libya to offset these cuts. We’re spending an average of $55 million a day to bomb Libyans while, as Bittman says, people here are going to bed hungry. I don’t care where you come down on the question of whether we have a national interest in Libya or not. Until someone explains why that national interest is greater than feeding our own children, or until some decides to start taxing GE and Bank of America to pay for this, the action is illegitimate. https://www.emptywheel.net/wp-content/uploads/2016/07/Logo-Web.png 0 0 emptywheel https://www.emptywheel.net/wp-content/uploads/2016/07/Logo-Web.png emptywheel2011-03-30 06:11:362011-03-30 06:11:36Mark Bittman: "I stopped eating on Monday"